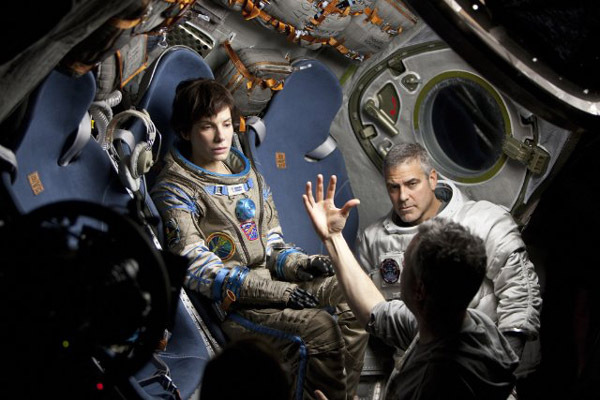 For the totally immersive experience that is the film GRAVITY, Director Alfonso Cuarón relied on family [his son Jonás co-wrote the script] and friends [Director of Photography Emmanuel “Chivo” Lubezki], and other highly-skilled professionals, including Production Designer Andy Nicholson, Set Decorator Rosie Goodwin, Art Director Mark Scruton and all of their teams to establish the world beyond our atmosphere and allow us to seemingly walk in space. 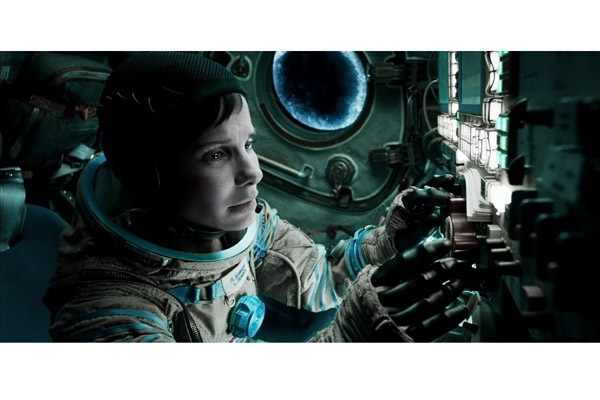 SET DECOR: For this film, you went about your own space[s] exploration, pushing the boundaries of movie-making with extensive pre-vis, Director of Photography Emmanuel “Chivo” Lubezki’s light box invention and custom-built robotic cameras…what a leap forward! Could we bring in another aspect, the practical sets? Can you talk about that and how you tied it all in with this amazing CG work? 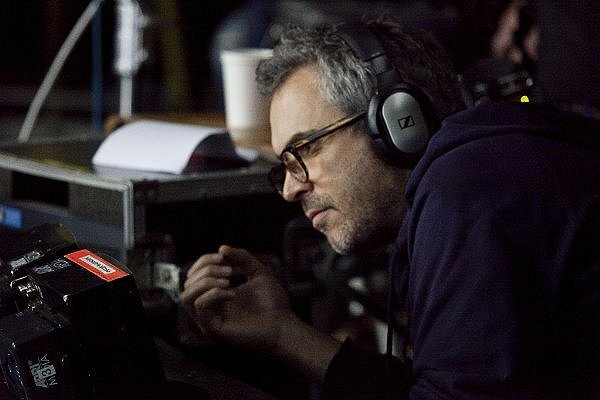 Director Alfonso Cuarón: Well yes, but the thing about talking about practical sets is very deceiving because the fact that you have practical sets doesn’t mean that set decoration, production design and art direction aren’t involved in the digital. Actually, that’s the interesting part of this process, that they were involved throughout…set decoration as much as the others. The only thing is that you change your tools. Now you are going to be building digitally rather than with wood and clay and plaster. In terms of the actual sets that we did practical, there were two kinds…what you could call the complete sets and the proxy sets. The proxy sets were fundamentally very important. They needed to have the exact dimensions and exact specifications of the final step, because that proxy set was going to be completely filled up digitally. So every single measurement was going to be fundamental…and not only the measurements and the shape, but also the precise colors, because that was going to effect the bounce of the light on the characters. So there was a fair amount of detail those proxy sets had in terms of form, shape and color. And then for the complete sets, we’re talking basically the two space pods. We went to great pains to do precise replicas of both the Soyuz and the Shenzhou, the Russian and the Chinese space pods. Actually, what has been fantastic is how much we’ve been praised by astronauts that have actually flown on them! 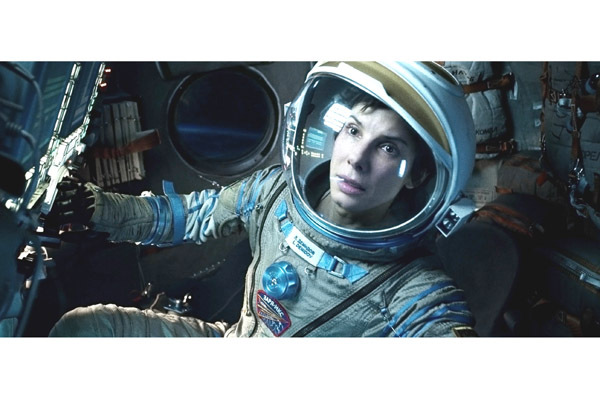 Not only the sets themselves, but also all the props and stuff around inside the sets, including that the instruction manuals, the procedures that Sandra [actress Sandra Bullock] follows and the buttons she’s pushing are actually the right ones! We only did one significant alteration from the original pods, and we decided to do the same alteration in both, particularly because Sandra was going to work in and have a dramatic function in both. The reason we felt comfortable about taking that mutual step is that the Shenzhou design is based on the Soyuz. In real life, the Chinese took the technology and the design of the Soyuz to build the Shenzhou. And in real life, the window on the left side is very small, so we widened the size of that window. Then, we did something else, something that was very important to me…we added a hatch! But, in our own cool way, we wanted to acknowledge the technology that they used. What we needed was a hatch that opens with a small explosive, like the hatch of the US space program’s Apollo. So our production designer Andy Nicholson took the designs and the technology of the hatches of the US Gemini and Apollo crafts, and adapted that technology into the shapes of the screws and the specifics of the Russian technology, and then of the Chinese. So in other words, he copied the technology of how that would operate and he adapted it to their technology. In many ways, he did what the Russians would have done had they wanted to add a hatch. Very likely, they would explore the Apollo hatch technology, which worked very well, and then adapt it to their own technology…and that’s what Andy did with those sets. By the way, it was so seamless that one of the real astronauts didn’t notice it until I mentioned it! There were other partial sets that included the Chinese station or the Hubble telescope, but I would consider those almost more proxy sets. And then we had miniatures for the landing on earth. We did have a half-sized miniature of the space pod with the parachute in perfect scale, and we actually landed that thing in a lake. SET DECOR: And then there were… again much of it was CG with Sandra sitting in the light box…but there were places with the actors actually holding things, for instance early on trying to repair the piece of scientific equipment on the Hubble Space Telescope. Is that proxy or is that an actual piece in front of the CG? Cuarón: Both. What it is, is photo enhancing. All of these were ultimately rendered, and this is what I mean when I say there is no distinction here in terms of the work of the art department in digital or in practical, because you’re using different technologies to build your set and define your pieces. In the physical case, when they were on the set, it was a proxy set and they were using proxy tools. What I am saying by “proxy” is that even the tools were the exact dimensions, the exact shapes. For instance with the drills, we would have some made completely weightless for the actors to use, we didn’t need them to actually operate and turn the screws. We would have an actual drill on the set, so the actors could get used to the dynamic and get an idea of how to hold the weightless ones, which were the precise color we needed and the exact shape. But then all this stuff was created in CG based upon the models delivered by Andy’s departments. SET DECOR: It’s interesting from a set decorator’s point of view, because there’s less focus on buying or renting the dressing or props. [Editor’s note: In the UK, props come under the set decorator’s jurisdiction.] This was certainly much more of a custom-manufacturing to exact specifications and established standards. Cuarón: That’s right, you don’t so much go out and buy. And yet, this was not like the case of when I did HARRY POTTER [HARRY POTTER AND THE PRISONER OF AZKABAN], where you obviously don’t go out and buy magic wands. You have to create magic wands, you have to design them and then have them made however you would like them to be. 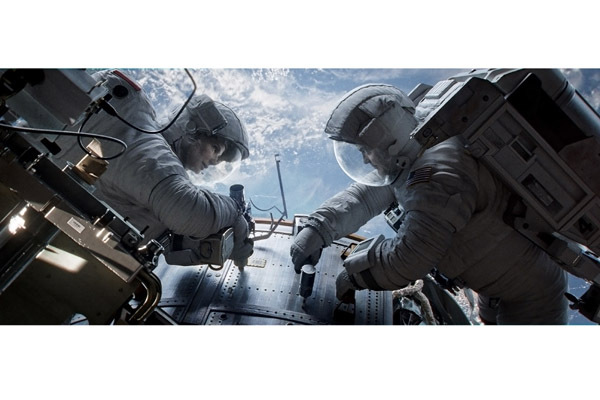 For this film, the rule was that everything had to be EXACTLY how it was in space. And I loved that because it’s something that the astronauts praised. 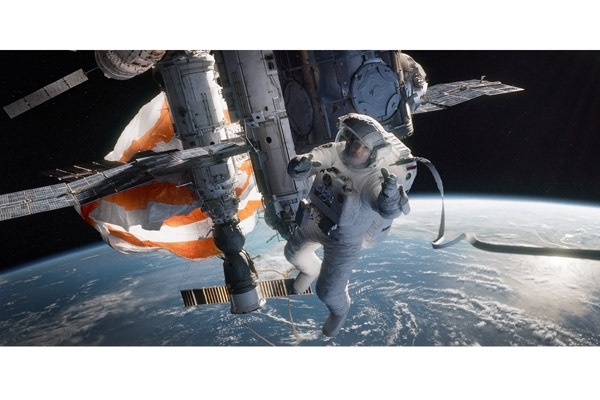 Astronaut Michael Massimino, who worked on the Hubble, said, “My god, I see her holding the same tool I was holding. I see her using it the same way I was using it!” And we were very careful about using the tools that they would be using and about everything in the set dressing. Now, in doing all the research, again this is not like where you could just invent the magic wand. You have to choose exactly the tools that they would be using…and then in many instances, deceptively, very deceptively, change the size! Because of our cinematic processes, for some tools we had to slightly modify the size…the drill for instance. Massimino said it was exactly like his, but we pointed out that it was actually smaller, because we realized in blocking that the full-sized drill was going to get in the way. Cuarón: See, the art department and set decoration goes further. I mean, I worked so hard with Rosie [Set Decorator Rosie Goodwin] because we knew the elements that we placed in the set would talk about the people in space, would reveal something about them. And I’m referring to the stuff that is floating, as well as everything that is in or on the walls of the space station. All of that had to be perfectly set decorated and art directed because we wanted to convey their history or their personality. We’re saying, “Okay, we see the corpses in the shuttle…now, which elements are we going to see in that shuttle as well?” To make sure that we see a little bit of the history of those people, you’ll see a baseball cap of a favorite team, or personal iPods and iPads…or, even where we have two dead astronauts, someone’s retainer is floating around. Later on, inside the Chinese space pod and the International Space Station, we see what the people who worked there had and what is on those walls. We tried to represent the actual stuff as much as possible, things that are in the space station. A “Kangaroo Crossing” sign is on the wall because an Aussie actually took one up there at some point, and there are orthodox religious icons from some of the Russians…but we also added some of our own stuff because I wanted to make some comments, so we have cave paintings and other details. SET DECOR: The details were incredible! Da Vinci’s Vitruvian Man, the space shuttle model, Marvin the Martian doll… But of course, that is what’s so important in set decoration, in filmmaking, in life…the details. Cuarón: Yes! I can be a pain about that…the details…and I’ve been very lucky that I have worked with amazing set decorators in the past, as well. For CHILDREN OF MEN, I worked with Jennifer Williams [Set Decorator Jennifer Williams SDSA]. I’m a big fan of Jennifer. She’s the best that I’ve ever worked with…she’s a genius. I truly believe so. We worked hours and hours and hours and days and days, just discussing the exact little things that are going to be in and on a desk, even if there is not going to be a close-up of that desk. Because I really believe that all that information informs so much…not in a rational, conscious state, but because behind the brain [in the back of the mind], there is something that says each part contributes to the whole truthfulness of the thing. Here, in GRAVITY, it was every corner. We would review every single corner for the magic, looking for every point where we would have any opportunity to show anything that would offer any history. There’s the production of stuff in terms of technology, but then there’s the stuff of the people that populated the space, the history of the people that were left behind. And it’s so important, the choices of the books, or the photographs that are seen on the walls, or the littlest thing. Again, it doesn’t matter whether the form is digital, it’s exactly the same work. You know, in the end, the technology thing….I mean it worries me a little bit when people are talking about which are the real sets, which are not. Well, everything is. This is a movie, nothing is real…everything is fake. And everything is created by the same group of people, just with different tools.